Spring is just around the corner right? Well that's what I keep telling myself anyway! Still quite a few bargains to be had online, I spotted yesterday, lifestyle store White Punch had a whopping 30% off everything! 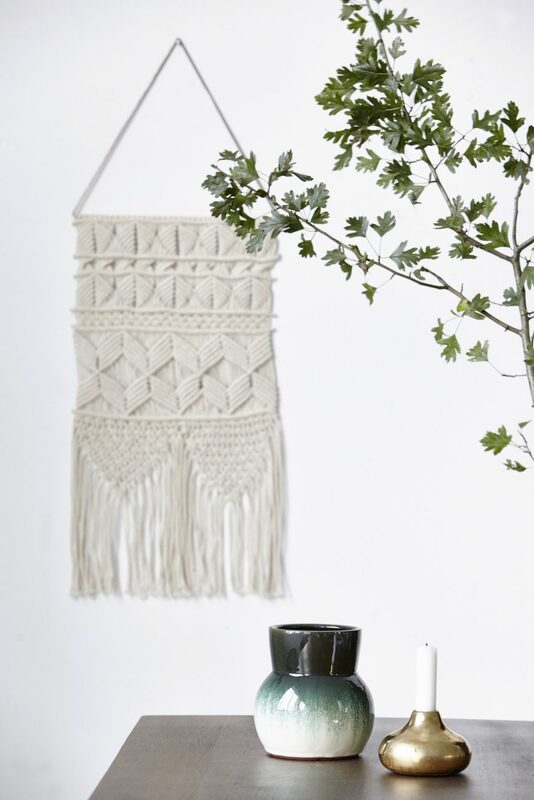 New stock is trickling in and I already have my beady eyes of quite a few bits and pieces.... First up pictured above the Macramé wall art from concept store At No 67, available early May ish but well worth the wait, I have my name on one of those already! Oh and priced at £39 which I think is very good. Next up is THE Hanging Chair from Madam Stoltz featured on the blog a few days ago, check here, and available from Le Repère des Belettes for 170 euros. Next a gorgeous rug from At No 67, priced at £139 and a perfect alternative to those beautiful but often pricey Kilhim rugs. Due in February from Pea Style, a must have little Moroccan side table, various sizes available.Next up from Rocket St George those handmade concrete tiles, I am eying these for the bathroom. Never too many candles and candle holders, this one from Violet and Percy, it is the Looped candlestick by Cooee Design . Last and I have to say I don't think this one is a new arrival for Spring 16 but I love it and I want it therefore it should be included here! It is the Morrocan metallic leather pouffe from Oh What's This, (also stunning in brown) £59.99. Happy shopping!